Welcome to our surgery website. We hope to present all our patients with up to date news and information about our practice. We will keep it current with any developments or other details that we feel are relevant to you. We do our best to ensure the information supplied on this website is kept up to date and accurate. If you notice any information that you feel is incorrect or if you would like to give feedback on the content of this site please contact the surgery using the comments and feedback form on the 'contact us' page. We now have a YouTube channel with informative health and surgery related videos. Click the link below to view our videos and subscribe. Due to increased patient demand and a National shortage of GPs, we are currently experiencing a longer than usual wait for routine GP appointments. We apologise to all our patients and ask you to bear with us during this difficult time. We would like to assure you that we are doing all we can to improve this situation. Need to see a GP or nurse in the evening or weekend? GPs in central Durham, Chester-le-Street and Derwentside are working together to offer extra GP appointments from 6.30pm on weekday evenings as well as Saturday and Sunday mornings. Just call your surgery to book any available evening and weekend GP appointments. These appointments are held at Queens Road Surgery and Tanfield View Surgery. To book an 'Extended hours' appointment please contact the surgery Monday-Friday 08.30-5.30. When our surgery is closed, please call 111 to access these clinics. The surgery phone lines will be closed from 12.00-12.30 daily. This is due to increased patient demand and a National shortage of GPs.We are working hard to improve this situation. When you book an appointment you will be asked the reason for needing the appointment. 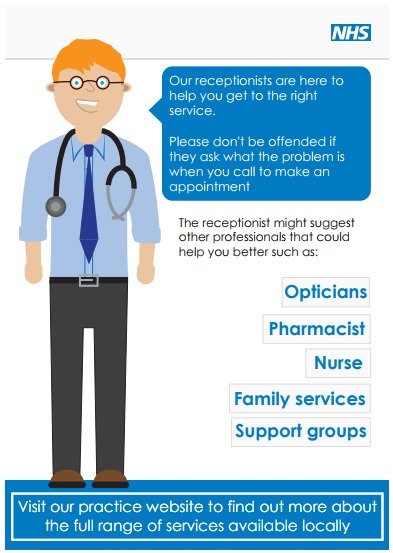 Your GP has requested that our reception team ask for this information. The surgery will be closed for staff training on Thursday 16th May 2019 from 12.00. We will be open again at 8.30am the following morning. If you require non-urgent medical attention while we are closed please call 111. For all medical emergencies please call 999. Take control of your health, wellbeing and fitness with the Evergreen Life app. Whether you want to get fit, get healthy, live longer, or take control of your health and medical records, Evergreen Life’s Personal Health Record app brings all of your health information together, in the palm of your hand. This is an NHS approved app.